Jason Pridmore (43) also competed in last year’s International Challenge at Phillip Island. While we motorcyclists and motorcycle road racing fans in the Northern Hemisphere muddle through the winter months, occupying our time in the garage or bench racing with our two-wheel-obsessed cohorts, it’s midsummer on the continent of Australia, and smack-dab in the middle of the road racing season. 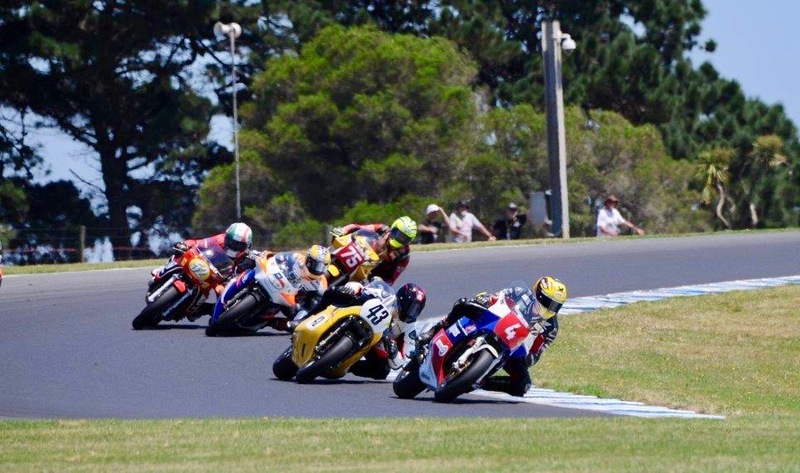 The 26th International Island Classic takes place this weekend at Australia’s Phillip Island Grand Prix circuit, and there are 56 races on the schedule. The centerpiece of the annual event is the fiercely contested International Challenge where teams compete in an all-out battle for points and bragging rights. The International Challenge is reserved for bikes manufactured between 1973 and 1984. There are four, six-lap races to decide the winner, with the highest individual scoring rider awarded the coveted Ken Wootton Memorial Trophy. The race format for the International Challenge was copied from the Easter Match Races, which were held back in the 1970s and 80s. The Match Races pitted a team of riders from the U.S. against a team from the UK over a series of races on UK circuits, and the event took place right around Easter each year. After finishing third in the 2018 International Challenge, Team America redoubled its efforts for 2019, and the U.S. squad is chock-full of legendary talent who are laser-focused on winning the event and toppling defending champions Team Australia. Josh Hayes joined Team America for this year’s International Challenge and tested his specially built Yamaha FJ1100 at Thunderhill this past October. be joined by the Mississippi Madman himself, four-time AMA Superbike champion Josh Hayes. Team America also includes Dale Quarterley, who is a former AMA Pro Twins and Endurance champion, as well as one of the only riders to win an AMA Superbike race as a privateer. Quarterley currently owns Quarterley Racing On Track Development and will field four riders in the 2019 MotoAmerica Liqui Moly Junior Cup championship. Joining Pridmore, Hayes, and Quarterley are current MotoAmerica Supersport rider Michael Gilbert, along with AMA road racing legends Steve Rapp and Larry Pegram, long-time AMA road racers Mark Miller and Barrett Long, and former AMA 250GP racer Bruce Lind. Team America also includes Australian expatriate Rennie Scaysbrook, who is an editor for Cycle News and has been racing successfully in America for the past several years, most notably competing aboard a KTM 1290 Super Duke R in the Pikes Peak International Hill Climb event. Leading Team America is riding captain Dave Crussell, who is a long-time veteran of vintage motorcycle road racing with more than 25 American Federation of Motorcyclists (AFM) and American Historic Racing Motorcycle Association (AHRMA) national championships to his credit. Steve Rapp’s FJ1100 features a stylish interpretation of Yamaha’s signature “bumblebee” racing livery made famous in the 1970s and early 80s. Pridmore, Hayes, Rapp, Pegram, and Gilbert will race Yamaha FJ1100 machines specially prepared by Mojo Yamaha, which is a motorcycle racing team that focuses on building classic Yamaha racebikes. Quarterley and Miller will each compete aboard 1984 Suzuki XR69 machines, Scaysbrook will race a 1980 Suzuki XR69, and Long will throw his leg over a 1982 Harris-framed Kawasaki 1250. Lind and Crussell will be each be aboard what is arguably the baddest two-stroke road racer in history, the Yamaha TZ750. Lind will race a 1975 “B” model of the legendary machine, while Crussell will campaign a 1978 “E” model. The 2019 event will be videotaped for a two-hour television program to be broadcast on FOX Sports in the US, Canada, the UK, Europe, Southeast Asia, and Australia in February.